Okay, I’ve never “served” as military folks put it, but I really enjoy reading about the exploits of those who have done so. Perhaps due to watching the exploits of astronauts with military titles in my youth, I still believe that the military will play some role when (or if) mankind actually goes into space and establishes colonies on other worlds. In my own Trinity on Tylos my main character, Major Venice Dylenski, has a military background, but I viewed her as a bit like “Captain” Miles Standish might be viewed in American history. He’s a military guy who is there for security, and my character is the security chief, because someone ought to be in charge of that when landing on uncivilized planets. 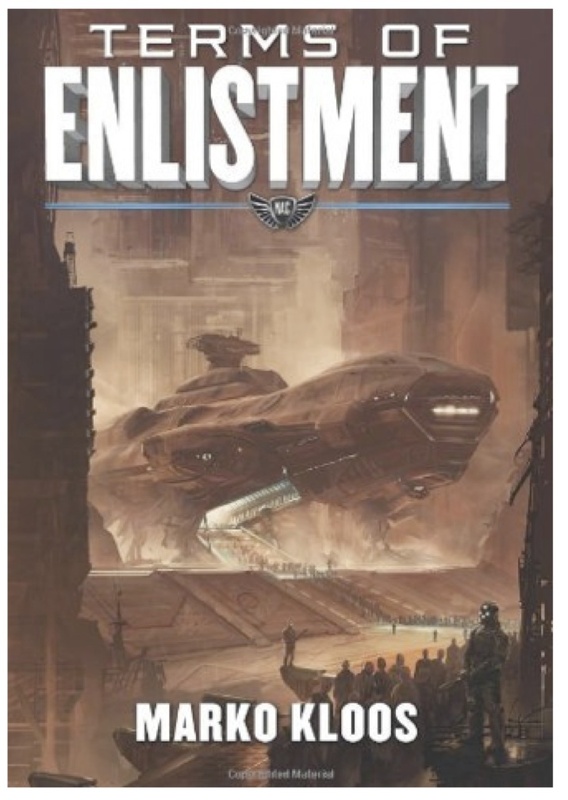 In Terms of Enlistment, by Marko Kloos, the military is far more than security; it is the force that keeps the homeworld (earth) and colonies safe. Andrew Grayson is the main character; he grew up in a welfare section of Boston. Desperate to leave the vicious cycle of generations on public assistance, he joins the military. Okay, that is hardly a new plot line, but as Kloos paints his picture of Grayson’s world, readers can easily believe this dystopian view of the “North American Commonwealth.” As a new NAC recruit, Grayson is under quite a lot of pressure. Failure in any area, from taking orders to passing tests, will cause him to “wash out” and go right back to eating welfare rations and watching his folks succuomb to treatable illnesses. Thus, there is an additional layer of suspense added to the usual risk/reward of enlistment. Once our hero gets through basic, he can expect a five-year hitch, then go back home with cash, and education, and a fresh start. However, once Grayson gets through basic, instead of being posted to a naval (spacegoing) vessel, he is placed into the TA (territorial army) and tasked with policing the very sorts of places that he sought to leave. However, as the yarn rolls along at its brisk pace, Grayson faces domestic enemies with courage and is able to use his heroism under fire to wangle a transfer to the space navy. Once there, he hopes to be set for his five year enlistment, but an alien species invades, and he has many more opportunities to be heroic, and less and less to return home to, as the government pours all of its resources into saving the colonies, leaving the homeworld to become barely habitable. While it doesn’t break much new ground, Terms of Enlistment does an excellent job of entertaining the reader. The main characters are more than stereotypes, and the world building is quite good. I’ve already re-upped for the second novel in the series (Lanes of Departure) and am enjoying it, too. Terms of Enlistment is a bit like Heinlein’s Starship Troopers, but with less of Heinlein’s political agenda. Fans of space opera and/or military fiction would be wise to check out this well-written novel. Oh, and it is rather long, so for $3.99 it really is a bargain, too.